The opposition Jumhooree Party (JP) has proposed conducting all-party talks to resolve the ongoing political crisis at the first meeting between the opposition party and President Abdulla Yameen’s representatives today. 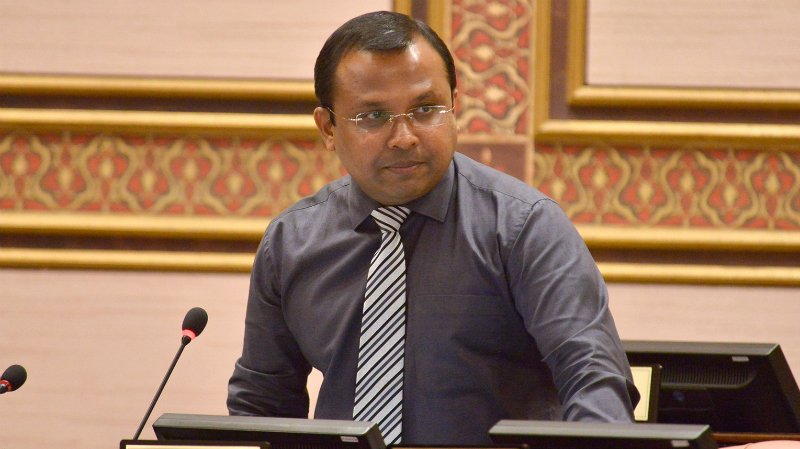 JP MP Abdulla Riyaz told Minivan News that the party proposed three other issues for discussion: freeing opposition politicians in jail or facing criminal prosecution within legal bounds, ensuring the independence of the judiciary, and protecting investors. A second meeting has been scheduled for 3:00pm on Sunday to discuss the proposals. President Abdulla Yameen had called for separate talks with the three allied opposition parties last month, but Riyaz said the JP today proposed setting up a “platform” for discussions among all political parties, including the ruling Progressive Party of Maldives (PPM). 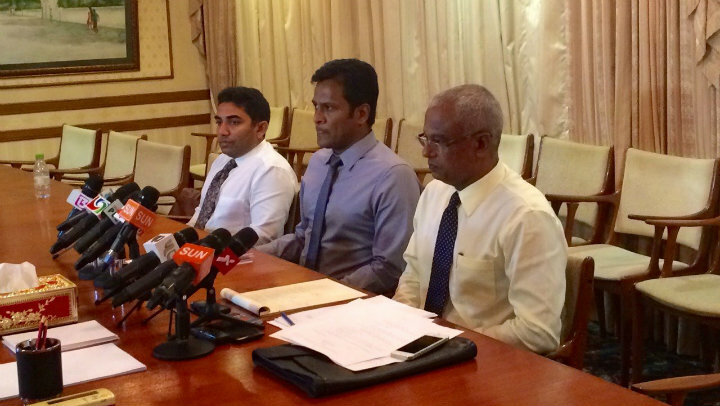 The JP’s representatives for the talks are MPs Riyaz, Ilham Ahmed, Faisal Naseem, and Hussain Mohamed. The government’s representatives include tourism minister Ahmed Adeeb, president’s office minister Mohamed Hussain Shareef ‘Mundhu,’ and environment minister Thoriq Ibrahim. Mundhu told the press that the discussions took place in “a friendly atmosphere” and both sides agreed on how to carry the talks forward. The ministers will present the JP’s proposals to the president, he added. The president’s official invitation for talks came after months of continuous protests over the imprisonment of ex-president Mohamed Nasheed and ex-defence minister Mohamed Nazim as well as a US$90.4 million claim on JP leader Gasim Ibrahim’s Villa Group. The JP immediately agreed to sit down with the government without conditions. Gasim has meanwhile been in Bangkok since late April. According to local media, the criminal court has issued an arrest warrant for Gasim on charges of financing a historic anti-government mass protest on May 1. Both Ameen and Sobah are out of the country. In a video message this week, Sobah said he is seeking political asylum. President Yameen has meanwhile ruled out negotiations over Nasheed and Nazim’s release. His agenda focuses on political reconciliation, strengthening the judiciary and political party participation in socio-economic development. Speaking to Minivan News today after Riyaz declared that the JP was not involved with the ‘Maldivians against tyranny’ alliance and the upcoming mass protest on June 12. MDP vice president Mohamed Shifaz said that JP members were working with the alliance in their individual capacity. He noted that the JP had not formally joined the alliance or supported the May Day protest. MDP MP Ibrahim Mohamed Solih meanwhile told the press this afternoon that all political parties should sit down together for the talks in order to ensure a positive outcome. “We think that a good result can be achieved when parties of all ideologies sit at the same table for discussions as all parties were given the same agenda and they have the same concerns,” he said. The newly-appointed British High Commissioner to the Maldives has also supported all-party talks. “We think it’s important that talks involving all parties should take place. It seems to me to be logical that talks should take place involving all the parties together, both the party in government and parties in opposition,” James Dauris said in an interview with Minivan News during a two-day visit to the Maldives in May. 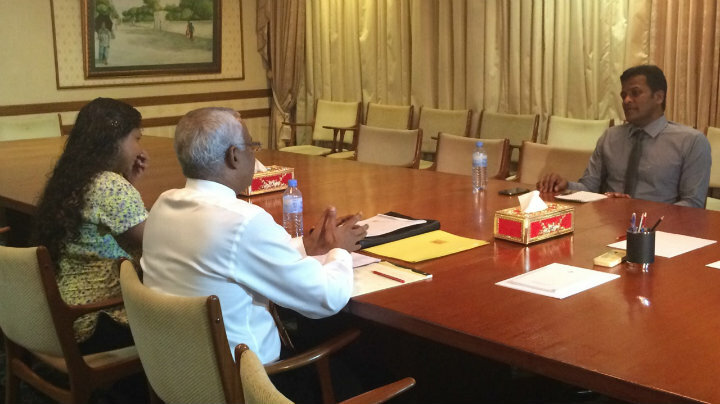 Crisis in Maldives: Can talks succeed? After months of daily protests and hundreds of arrests, the Maldivian government has called for separate talks with the allied opposition parties. But Maldivians are skeptical of a solution with the government unwilling to discuss the triggers for political unrest – the imprisonment of ex-president Mohamed Nasheed and ex-defence minister Mohamed Nazim. The main opposition Maldivian Democratic Party (MDP) insists Nasheed must represent it at the talks, but President Abdulla Yameen has rejected the former-president’s nomination on the grounds he is serving a 13-year jail-term on a terrorism conviction. The president’s agenda consist of political reconciliation, strengthening the judiciary, and political party participation in economic and social development. The belief the government wants to keep Nasheed in jail at all cost is widespread. The government insists Nasheed and Nazim must exhaust all domestic appeal processes, while President Yameen says he has no constitutional authority to release the pair. A ruling Progressive Party of the Maldives (PPM) activist from Fuvahmulah said he, too, does not expect a meaningful outcome from the talks. “The government has not released Nasheed and Nazim despite repeated calls from the international community to release the pair. So why would they listen to demands from domestic political parties?” Basil Thuthu, 22-years, questioned. Why does the government want to keep Nasheed in jail? “If the government decides to release Nasheed, which I don’t think will happen, he would again fight for the presidency and the government would want to shut him up again. So hope for a politically stable country is a much too ambitious goal,” Basim Abdulla, a young professional designer said. “With Ramadan just a few weeks away, I think political activity will slow down. But I do not see lasting stability,” he said. Some see MDP’s call for Nasheed’s release as stubborn. A lawyer who wished to remain anonymous said the government, for the first time, is willing to discuss judicial reform. The MDP must use the opportunity to reform the judiciary, a step that will lead to Nasheed’s release, he said. “We all know the justice system is corrupt and weak. This is the reason why Nasheed is behind bars right now. So why not stop all the work and work on reforming the justice system? The government with all its might is saying they won’t release Nasheed. 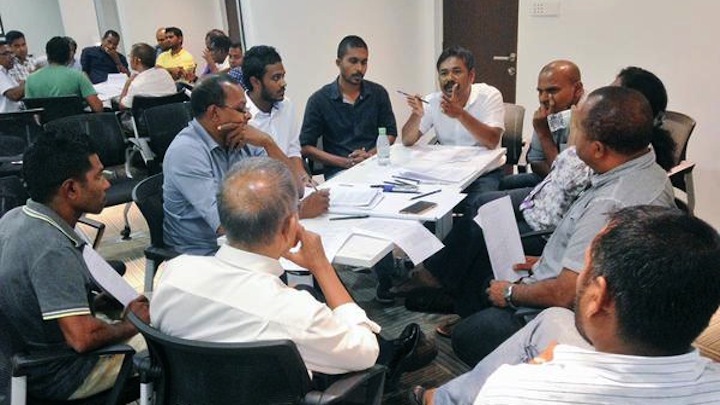 I think it’s time for MDP to compromise,” he said. But others say if the MDP compromises and gives in, it will lose public support. “The government is not backing up even a bit. So if MDP gives in now, and stay quiet, they will face a big defeat in the next election,” Mohamed Ismail Umar, 46, from northern Kulhuduhfushi Island said. One PPM activist, however, said he expected a solution soon. “The president wants to involve everyone in the discussions. I think it is impossible for Nasheed to participate in the talks and it doesn’t make any sense as he serving a sentence right now. So eventually, if the political parties want a solution, which I think is what everyone wants right now a positive outcome will come,” Ahmed Abu Bakuru, a coordinator at the youth ministry, said. The invitation for talks was extended on May 14, but there has not been any substantial progress yet. The opposition is now planning a third mass protest for June 12. Many opposition supporters say they have no choice but to keep on protesting. 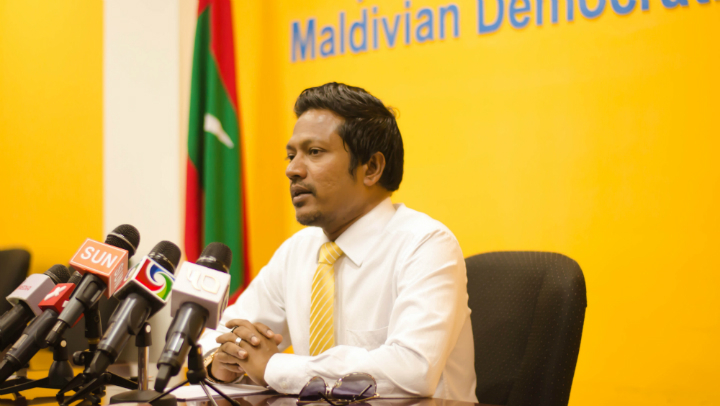 The MDP youth wing’s president Mohamed Azmeel said he is encouraged by the increasing support for the opposition. The numbers at protests are growing, he said. Over 10,000 attended a mass protest on February 27, while over 20,000 attended the May 1 protests, he said. “The call for talks is just a game. The government only wants to appear reconciliatory when, in fact, they are not. I do not see any hope at this moment. But this will eventually end in the citizens’ favour. The longer this stalemate continues, more and more people will get fed-up, and the government will be eventually forced to back down,” he said. For others, the government’s intransigence in the talks signals a slide into authoritarianism. “I think the future is quite clear. The country will be stable but we won’t be practicing democracy. We might get a glimpse of development here and there but people won’t be free. We are heading towards a long dictatorial regime,” Ibrahim Lirar, a 27-year-old resort worker said. Posted on May 31, 2015 Author Hassan MohamedCategories Features & Comment, Politics, Society & CultureTags all-party talks, maldives, maldives news, MDP7 Comments on Crisis in Maldives: Can talks succeed? The government has rejected ex-president Mohamed Nasheed as a representative for talks with the main opposition Maldivian Democratic Party (MDP). In a tweet today, president’s office spokesperson Ibrahim Muaz Ali said the government had rejected Nasheed’s name because he is serving a jail sentence. Nasheed was sentenced to 13 years in jail in March on terrorism charges relating to the detention of a judge during his tenure. Foreign governments and international bodies including the UN have criticised the trial for apparent lack of due process, while the European Union parliament has called for the ex-president’s immediate release. 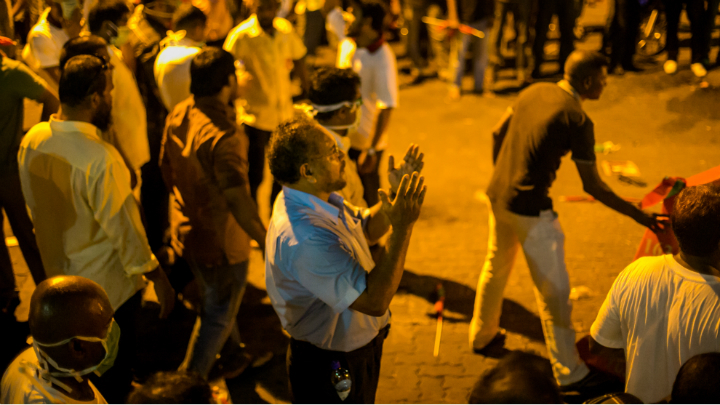 Nasheed’s arrest and jailing triggered daily protests and a historic anti-government protest on May 1. Nearly 20,000 people took to the streets and some 193 people were arrested. The government subsequently called for separate talks with the three allied opposition parties – the MDP, the Jumhooree Party and the Adhaalath Party. The MDP’s national council yesterday proposed Nasheed, chairperson Ali Waheed and parliamentary group leader MP Ibrahim ‘Ibu’ Mohamed Solih to represent the party in talks with the government. MDP vice-president Mohamed Shifaz said the party will hold a meeting to decide on a response to the president’s office’s statement. “But I personally believed that we should be able to determine who should represent us. Not the government,” Shifaz said. In late April, the pro-government majority voted through amendments to the Prison and Parole Act that prohibited inmates from holding high-level posts in political parties. 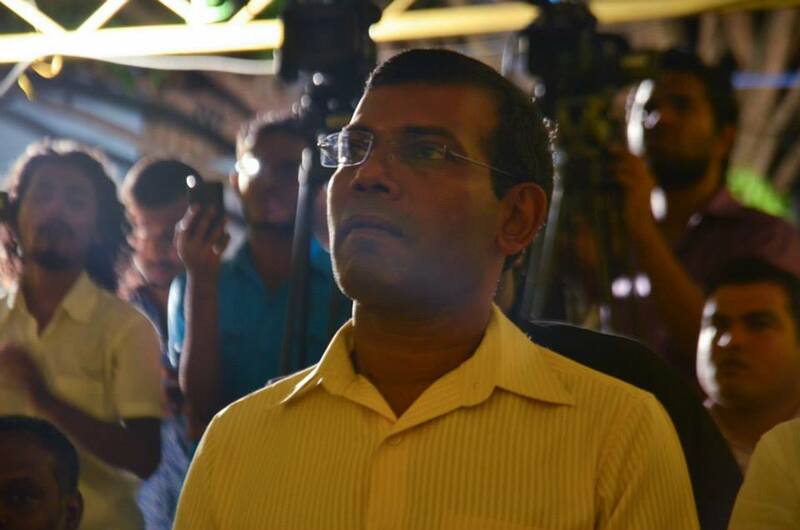 The revised law effectively stripped Nasheed of the MDP presidency. Some ruling party MPs have also threatened to cut financial payouts to Nasheed by amending the law on privileges and immunities of former presidents to exclude individuals serving a jail sentence. Speaking to Minivan News, Muaz said the government will proceed with the talks as soon as representatives are decided. “If there is no legal, medical, physical or administrative obstructions regarding the representatives proposed by the three parties, we will proceed with the talks,” he said in a tweet today. The government has ruled out negotiations over the release Nasheed and former defence minister Mohamed Nazim, insisting the president does not have the constitutional authority to release convicts before the appeal process is exhausted. The opposition has previously questioned the government’s sincerity, pointing out that several opposition leaders had been arrested from the May 1 protest. Imran was arrested on May 1 and remains in police custody. The JP’s representative for talks, deputy leader Ameen Ibrahim was also arrested, but released by the High Court. The police are appealing the court’s ruling at the Supreme Court, a move the opposition says is aimed at barring Ameen from representing the JP. During the national council debate yesterday, MP Eva Abdulla stressed the importance of talks involving all political parties, including the ruling Progressive Party of Maldives (PPM). The opposition coalition has called for a third mass protest on June 12.